Here at SoundRoots we love us some rambunctious dance music, loud and percussive and energetic. Balkan, klezmer, Afrobeat, samba, and funk have all been represented here recently. But sometimes we just want to sit and listen attentively. We want to hear the music as much as feel it. We want to revel not only in a song's energy, but in the precision and excellence of the musicians. 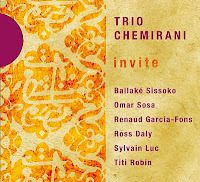 For that kind of listening, you need go no further than the new release by Trio Chemirani, called Invite. Officially they're a Persian percussion group fronted by the Chemirani clan: Djamchid, his sons Bijan and Keyvan, and daughter Maryam. Fronted, but in this case with some notable musical additions, including Ballaké Sissoko (kora), Omar Sosa (piano), Renaud Garcia-Fons (bass), Ross Daly (lyra, rebab), Sylvain Luc (acoustic guitar), and Titi Robin (bouzouki). The crisply recorded, brilliantly played compositions are so gorgeous they easily transcend any categorization as only "world music" or "world fusion." The cross-cultural songs flow naturally with such clear mastery of musicians and voice that they will appeal to any open-minded lover of classical music, folk music, or just plain great music. Just check out the interplay of kora and piano on the track Azadeh. A devoted fan of the kora, this is one of my favorite tracks on the album, along with the other songs featuring Sissoko: "Alou Soroma" and "Taama." And pianist Sosa also appears on the fiery "Flamenco Mar," which arguably blends Gypsy-influenced music from several geographic and temporal locations into one seamless now. Apart from the fantastic collaborations, the Chemiranis contribute a few tasty percussion-only tracks, including the album opener "Dar Bâzé." Even with a quarter of 2011 yet to come, Invite seems likely headed toward a spot on the SoundRoots annual top 10 list. Be sure to check it out.